The Consolidated PBY Catalina flying boat is one of the most famous aircraft types ever built and served with distinction in the Anti-Submarine, Maritime Reconnaissance, Search and Rescue, Mine Laying and Special Forces support roles in World War II. Designed during the 1930s, it was obsolete before hostilities started but proved essential once they did. The prototype first flew in March 1935 and the type was produced from 1936 to 1945. It was so valuable that it was not until January 1957 it was finally retired from United States military service. 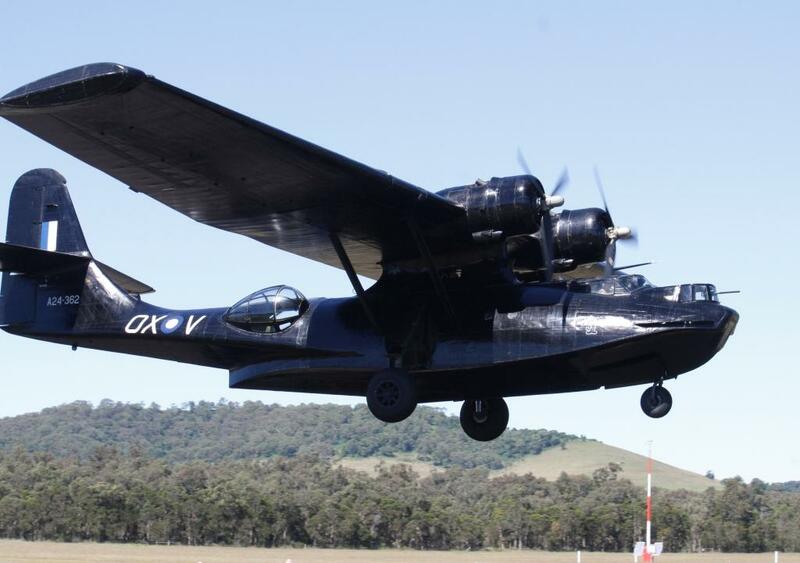 In Australian service, the Catalina is best known for its service during WWII as “Black Cats” and for flying the Qantas “Double Sunrise” service. In the role of the Black Cat, the Catalina operated from Australia into South-East Asia at low level at night, mining harbours and supporting “Z-Force”, the precursor to the SAS. As can be imagined, such operations were extremely dangerous. Of the number of Catalinas manufactured (over 3,000), the earlier models were built as flying boats. Later production models were amphibian versions – they had landing gear that enabled them to be used from land bases. 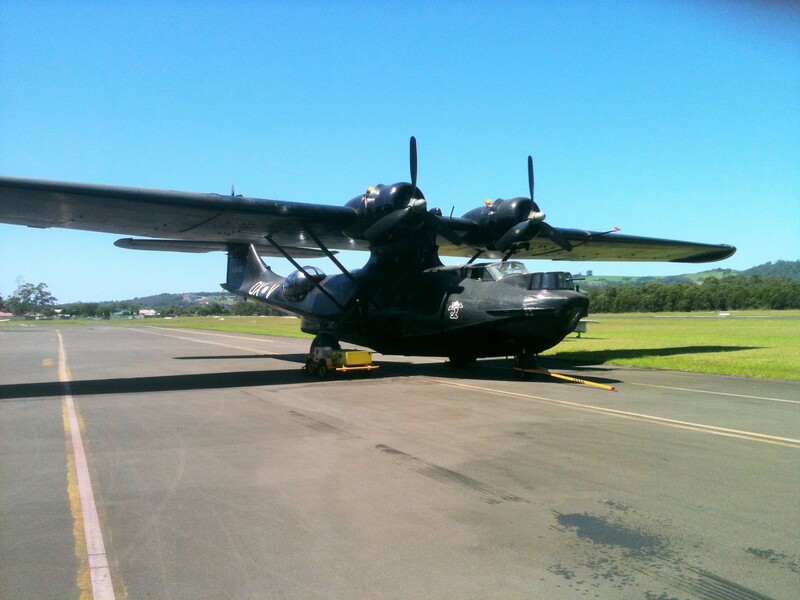 All Catalinas operated by the RAAF and Qantas during WWII were flying boats. After the fall of Singapore and with the Japanese occupation of South-East Asia, Australia became cut-off from direct communication with Europe. 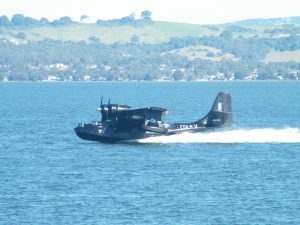 It was decided that Qantas would receive five Catalina aircraft under “Lend-Lease” to operate direct Perth – Ceylon services, operating from Crawley Bay on the Swan River in Perth and lake Koggala in Ceylon (Sri Lanka). To increase the range of the aircraft to the 3,600 nautical miles (6,700 km; 4,100 mi) that would be needed, they were stripped of all non-essential equipment and additional fuel capacity was added to give them almost 2400 US gal / 2,000 imperial gallon capacity, up from the standard 1750 US gal / 1450 imp gal. Weight was so critical that only three passengers, and one passenger weight of cargo could be carried. The mail was “microfiched” so as to enable it to be carried. The five aircraft were given the names ‘Rigel Star’, ‘Spica Star’, ‘Altair Star’, ‘Vega Star’ and ‘Antares Star’ after those stars used by the Navigators to find their way. The service started on 29 June 1943 and 271 crossings later was concluded on 18 July 1945 when Liberators took over. Performance was so critical that should the aircraft suffer an engine failure in the first few hours of flight, it would be unable to remain airborne. Once the aircraft departed, then for the next thirty or so hours as the aircraft flew along at 100 kt, no one knew where it was until it arrived at its destination. Once there, passengers were presented with a certificate – “The Secret Order of the Double Sunrise”. At the completion of the war, the five aircraft were scuttled off Rottnest Island off the coast from Perth / Fremantle. Here is a talk given by one of the Double Sunrise Crew. The Catalina operated and maintained by the Historical Aircraft Restoration Society (HARS) was acquired in 2002 in Portugal where it had been operated as a water bomber under Chilean registration, and in September 2003 began a three week flight to Australia, arriving at Illawarra Regional Airport on 5 October 2003. The aircraft is a PBY-6A model, built in 1945 by Consolidated at its New Orleans plant, c/n 2043 and delivered to the US Navy. It was later sold as surplus to the Aircraft Instrument Corporation and placed on the US Civil Register as N9562C. It was later transferred to Chile and flew with several companies until placed in storage in 1960 for twenty years. It was retrieved from storage and began operations as a water bomber with registration CC-CCS. Whilst in fire fighting service on 27 January 1986 the aircraft sank in Lago Guitierrez, Argentina. It was salvaged, rebuilt and back in service in 1988. In 1991 it was ferried across the Atlantic for operation by the Spanish Land Management Department ICONA. Subsequently it went on charter to Aerocondor in Portugal. HARS Catalina has been restored to conform as closely as possible to the configuration of the famous RAAF ‘Black Cats’ of WWII. 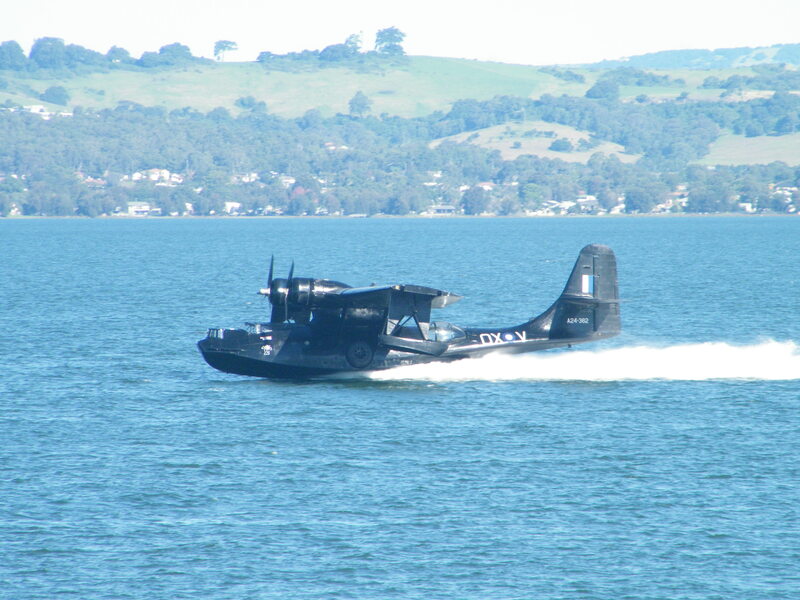 The RAAF ‘Black Cats’ were pure flying boats, enabling long range and maximum possible loads with extended water take offs. The HARS PBY-6A is an amphibian (with retractable wheels), but once in flight with wheels retracted, it resembles the original ‘Black Cats’ very closely. The aircraft markings selected are those of A24-362 which served with 43 Squadron RAAF as OX-V. This aircraft was flown by HARS member Rees Hughes. The original A24-362 had the tail fin of the PBY-6A. For a history of VH-PBZ and a collection of great images, go to here.